Four new THX® 3D Certified models use e-Shift technology to upconvert images to four times the resolution of Full HD. WAYNE, NJ, December 6, 2011 – New JVC home theater projectors that display 2D HD content with full 4K precision are now shipping. Announced at CEDIA Expo in September, the new models feature JVC’s new e-Shift technology capable of projecting images with 3840 x 2160 pixel resolution, four times that of full HD. The upconverting technology is available in four of seven new 3D-enabled projectors that boast a wide range of advancements, including higher native contrast than previous models for levels that remain unmatched by any other home theater projector. 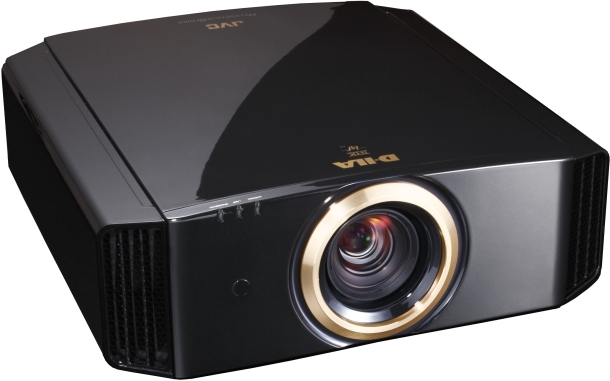 The new projectors are the Procision Series DLA-X90R, DLA-X70R and DLA-X30, marketed by JVC’s Consumer Electronics Group, and the Reference Series DLA-RS65, DLA-RS55, DLA-RS4800 and DLA-RS45, available through JVC Professional Products Company. JVC’s 4K e-Shift technology is featured in the top four models, which are also THX® 3D Certified. All seven new projectors offer other advancements that boost picture quality, improve 3D performance and enhance functionality. Earlier this year NHK Science & Technology Research Laboratories, NHK Engineering Service Inc. and JVC Kenwood Corporation collaborated in the development of a Super High Vision projection system that utilizes e-Shift technology. Now, that technology is available in the DLA-X90R, DLA-X70R, DLA-RS65 and DLA-RS55. Using e-Shift, 2D HD content is upconverted and scaled to a 4K signal (3840 x 2160) and the e-Shift technology displays it at full 4K precision. Compared to a Full HD (1920 x 1080) image, that’s twice the horizontal and vertical resolution and four times the number of pixels, or over 8 megapixels. The result is a stunningly detailed image with minimal aliasing artifacts found in standard HD displays. • Direct access to 3D formats and settings on the remote control. In addition, the top four models -- DLA-X90R, DLA-X70R, DLA-RS65 and DLA-RS55 – are THX® 3D Certified. During the THX 3D Certification process, more than 400 laboratory tests are conducted, evaluating color accuracy, cross-talk, viewing angles and video processing to ensure the superior out-of-the-box 3D and 2D display performance that home theater enthusiasts demand. • Three Xenon lamp color modes that emulate the characteristics of high-end movie projectors. • LAN connection that provides enhanced system control and firmware or screen mode updates. To provide enthusiasts with a true measure of performance, JVC has long focused on native contrast and refused to artificially enhance contrast specifications through the use of a dynamic iris. For 2012, native contrast has been improved across the entire line, ensuring that every frame consistently and faithfully reproduces peak whites and deep blacks. The new flagship projectors, the DLA-X90R and DLA-RS65, are built using hand-selected, hand-tested components and provide a 120,000:1 native contrast ratio. For 3D viewing, both models come with two pairs of 3D glasses and a PK-EM1 3D Signal Emitter. Both projectors also have a three-year warranty. The DLA-X70R and DLA-RS55 offer 80,000:1 native contrast ratio, while the DLA-X30 and DLA-RS45 offer 50,000:1 native contrast ratio. All four come with a two-year warranty. The DLA-RS4800 is ISF certified, offers a 55,000:1 native contrast ratio, comes with a three-year warranty, and includes a spare lamp. JVC PK-AG2 Active Shutter 3D Glasses and the PK-EM1 3D Signal Emitter are sold separately. All seven new projectors feature three 0.7” 1920 x 1080 D-ILA devices and are designed around JVC’s third generation D-ILA High Dynamic Range optical engine that is optimized to provide exceptional native contrast ratios without a dynamic iris to artificially enhance contrast specifications. A directed light integration system and wire grid polarizer ensures optimum light uniformity and minimal crosstalk in the light path. In the top four models (DLA-X90R, DLA-X70R, DLA-RS65 and DLA-RS55) a combined 16-step lens and lamp aperture adjustment allow the user to optimize the f-number (relative aperture) of the optics system in all steps. The DLA-X30, DLA-RS45 and DLA-RS4800 feature a 16-step lens aperture.